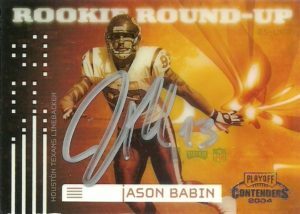 A tweener, (6’3″, 260lb,) Jason Babin was drafted in the first round of the 2004 draft by the Houston Texans from Western Michigan to play defensive end and linebacker in the Texans 3-4 front. (The pick came at some fanfare and a major cost. The Texans had to trade back into the first round and paid a king’s ransom to divisional rival Tennessee to get him.) He’d start all 16 games his rookie season, with 63 tackles, 4 pass defensed and 4 sacks, but in 2005 the team decided to make him a situational rusher, so he’d start less, and also play less with 12 games and 4 starts. Babin would pull in another 4 sacks and 2 forced fumbles. In 2006 he’d have 5 sacks, but with a new head coach and general manager who had no ties to him- Jason would see himself traded to the Seattle Seahawks for Michael Boulware in 2007. He’d then become a journeyman from there, playing for the Seahawks, Chiefs and Eagles over the next 3 seasons almost seeing himself out of the league. 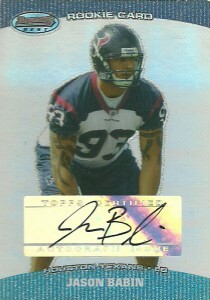 In 2010 he signed with the Titans and has rejuvenated his career scoring a career high 12.5 sacks (6th in the NFL). After the Titans beat the Texans in a fairly meaningless game in week 15- the team let him come onto the field to kneel the ball to end the game. Of note, Babin is recognizable for an assortment of tatoos that cover his arms. 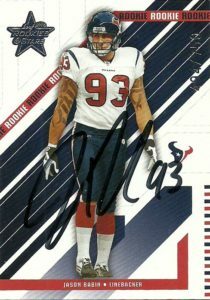 I bought his card on the cheap off of Beckett when I was attempting to get the autographs of all the Texans’ first round draft choices.